Hi everybody! 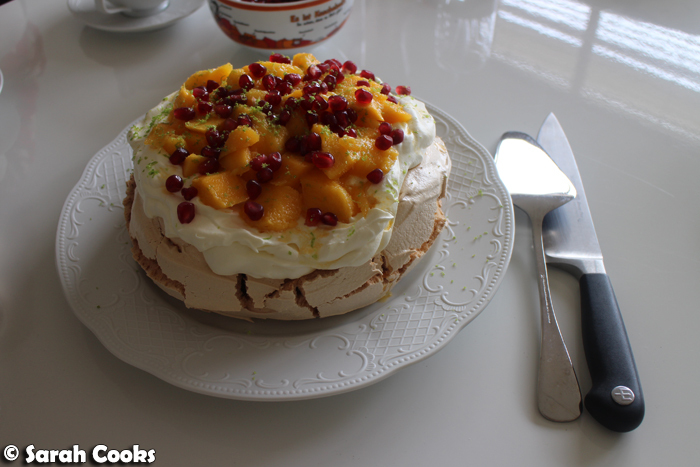 Well, today is Australia Day and I took advantage of the public holiday to have my parents over for lunch! 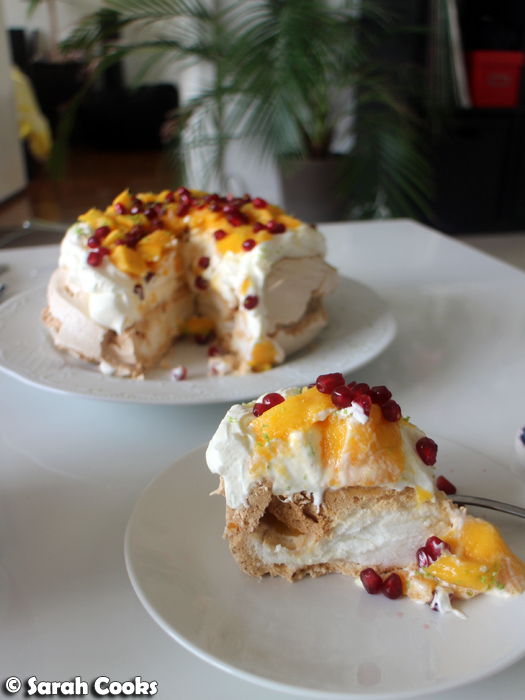 I went for a simple yet special menu, relying on my Australia Day fallback: lamb and a pav. Last weekend, we had some friends over for brunch, and our friends Amelia and Dave gifted us some homemade mint and basil pesto from their own home grown herbs. (Yay!) I remembered recently reading a post about mint pesto on David Lebovitz' blog - he served it with roast lamb, and I thought Amelia and Dave's pesto would be just perfect with lamb. And thus, the idea of an Australia Day lunch was born. 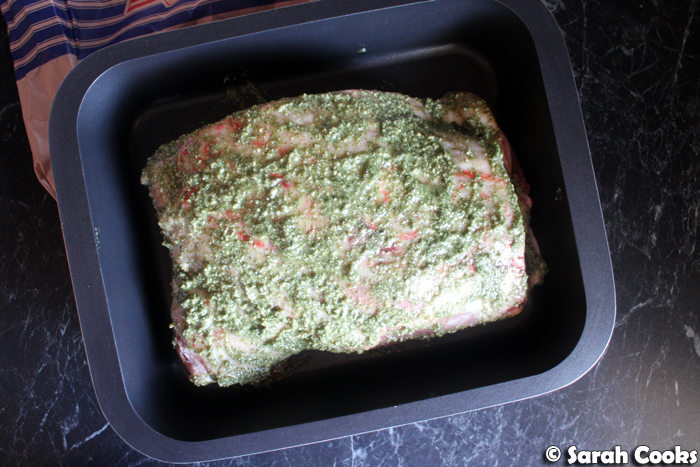 We bought a lovely lamb shoulder, and as per a suggestion in Nigella's How to Eat, I slathered the lamb shoulder with the pesto before roasting it. It smelled amazing in the oven! The pesto made the lamb a little dark, but didn't taste or smell burnt at all. And actually, the pesto caramelised with the lamb fat and was incredibly delicious. The carb of choice was potato squares, roasted with garlic and olive oil until crisp. 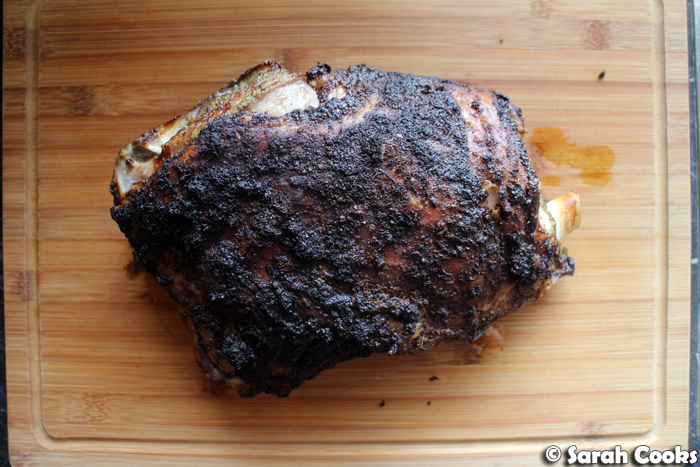 I roasted these on a shelf under the lamb, so it was super easy - just set and forget. When I wrote my last post about restaurants in Germany, I saw that something we'd ordered came with a side of bacony beans and it looked so good! I thought this would be an awesome side. 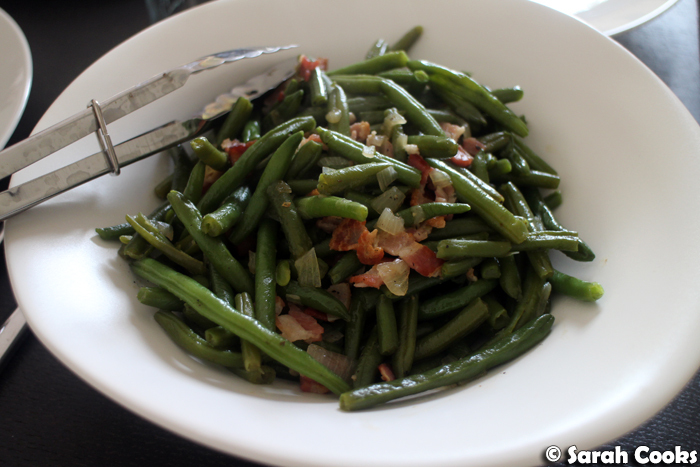 Sandra came up with the method and cooked them - she chopped a couple of rashers of streaky bacon and cooked them slowly with a chopped onion, then tossed in some frozen green beans and some stock, and let them cook until the beans were soft all the way through. Zomg, delicious! I plan to make this very frequently in the future. You know, I wasn't intending on making a dessert at all, but earlier this week we did a clean up of the freezer, and found like twenty egg whites in there. A stash of egg whites just before Australia day? It was fate! 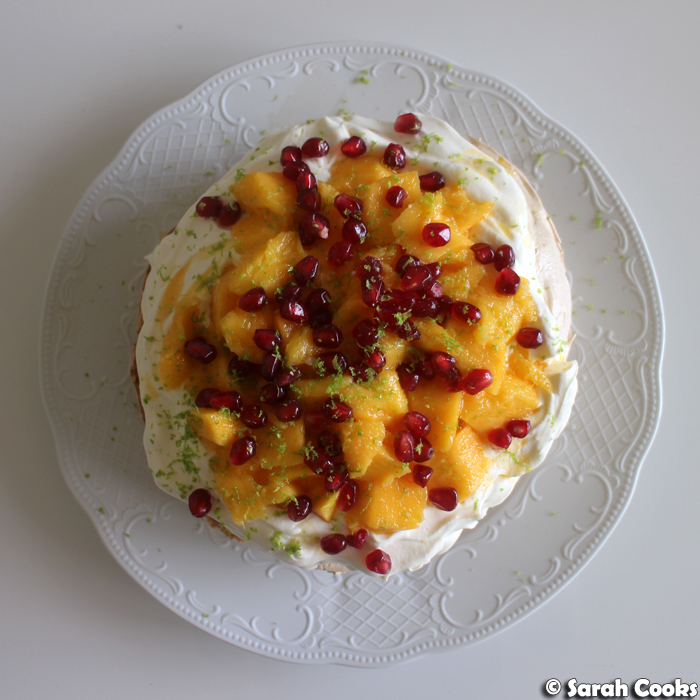 I topped it with mango, pomegranate and lime zest for a summery, tropical feel. Preheat the oven to 210C. Take the lamb out of the oven to come up to room temperature. 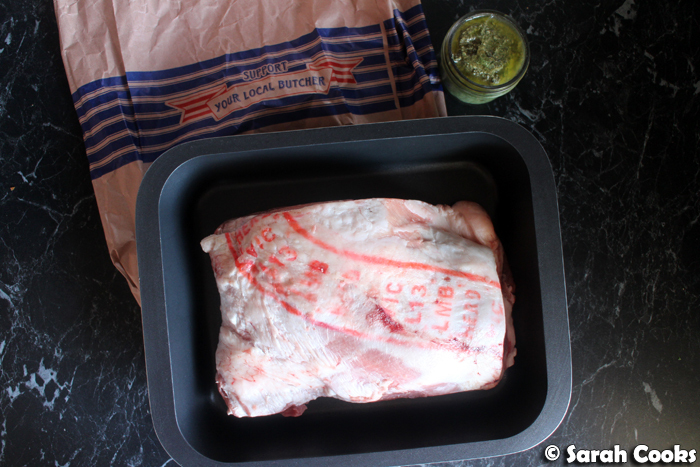 Rub the lamb shoulder with the pesto. 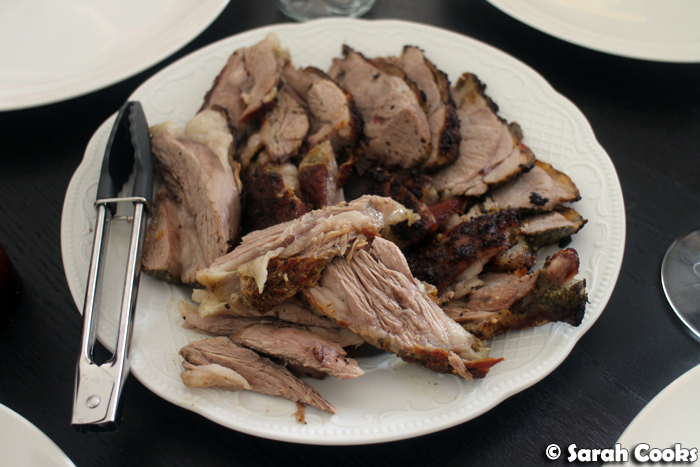 Place in a roasting tray and roast for 30 minutes per kilo plus 20 minutes overall. 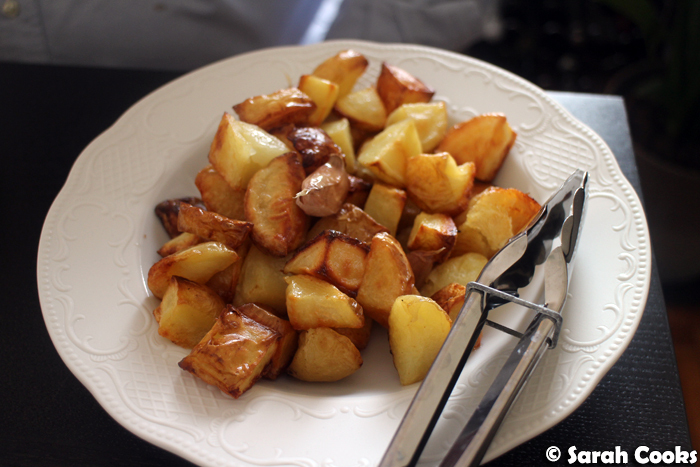 Wash the potatoes and cut into approximate 2 cm cubes. Place the potato cubes in a roasting tray with the garlic cloves. Drizzle with olive oil. Roast for 1 hour until cooked through and crisp. Season generously with salt to serve. Heat a splash of olive oil in a small saucepan. Finely chop the bacon and onion, and add to the pan. Cook over a low-medium heat until softened. Add the green beans and stir to coat. Add the stock and bring to the boil. Turn the heat down to low, and allow to cook until the beans are cooked through and no longer squeaky. Woohoo. 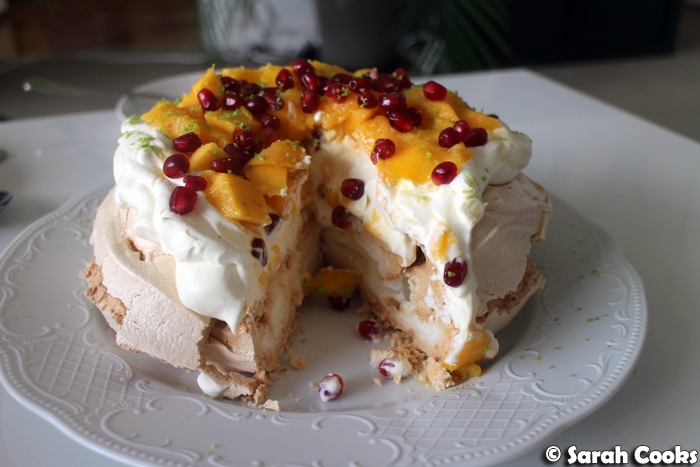 Aust Day with lamb and pav? It doesn't get any better!